This is the text of my remarks from Santa Clara University’s Institute of Sports Law & Ethics 2015 Sports Law and Ethics Symposium. The Symposium was held on September 10, 2015. I was on the” Fantasy Sports: Gaming, IP, Ethical and Other Issues” panel. The symposium was great, I want to thank ISLE for inviting me. This panel is made up of lawyers and industry leaders who have direct involvement in the business of fantasy sports. I’m an academic philosopher who plays fantasy sports purely for fun. So, my approach is probably going to be a little different. As a philosopher, I seek the deeper, more fundamental meaning of things. As an ethicist, I look at this deeper meaning and try to see what it tells us about how best to act. In this case, what does understanding the nature of fantasy sport tell us about how to act regarding fantasy sports? 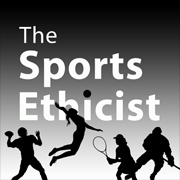 My time is limited, so I will point towards some of the ethical concerns in fantasy sport, and close with some of the positives. Fellow sports philosopher, Chad Carlson, dubs Fantasy Sports: “parasitic, second order, or derivative games because they find life only by building off of real sports’ elements.” Fantasy is driven by the real sport, without the football there is no fantasy football. This makes them games about other games. Calling them parasitic suggests something negative about this relationship; that fantasy feeds off and harms its host sport. But before addressing that concern, it is important to see that fantasy sport, though a game that is built off another game, is still truly a game: it has its own distinct goals and methods. It has its own rules, structures, and traditions. But this derivative nature of fantasy does lead to a group of objections to fantasy. These objections are all roughly based on the concern that fantasy sports are changing the way we understand, consume, or appreciate sport. The derivative game is affecting the primary game and, according to these objections, that’s wrong. Fantasy, particularly fantasy football, tends to overemphasize certain features of the game over others. In general, offense is emphasized over defense. Certain positions, like QB or WR, are emphasized over other essential positions, like left guard or a blocking TE. These latter positions are essential for competitive teams to be able to play offense well, but they are not tracked by fantasy (at least not directly). This tends to skew our understanding of the game of football in one direction. Fans might come to prefer to watch something like the Red Zone channel instead of a game in its entirety. This breaks up our sense of the continuity and narrative of the game of football. If we only watch scoring plays or highlight plays, we don’t really know how the game went. We don’t really understand how the teams played. I know that when I have missed a game and just get the highlights, I have one impression of the game that can be quite different and misleading from the one I get when I get around to watching the tape of the game. So if fantasy shifts our consumption shifts more and more towards individual players and their highlight moments, we lose a certain aspect of what the primary, real game is about. I don’t have the space to fully flesh this out, but one response to this spectator corruption argument is that fantasy is not the cause of this trend, but an effect. That is, fantasy might just be popular because it is tapping into a pre-existing desire to watch football in this manner. It might be that the only reason we sat and watched one team for the whole game and watched that team week in week out is that prior to satellite, one just didn’t have any other options. Now one has a myriad of consumption options, and this has opened up fandom in new ways. That seems to be a good thing for fans. A second group of concerns about fantasy sports is that it is just a kind of gambling. It is not, according to these objections, based on superior skill, effort, or knowledge but luck. First, even if this is true—and I don’t think it is—it’s not clear that this is an objection to fantasy without a second argument that gambling is itself wrong. Second, while a fantasy player does not have as much agency or ability to affect the fantasy game outcome as the running back or the coach does in real football, the fantasy player does have to draft well, adjust his or her line up, and make other important changes that will bear on the outcome. A fantasy player’s skill and knowledge at doing this affects their chances of winning. Much like words with friends (a scrabble-like game), you have reduced agency. You can only play the letter tiles you are dealt. It doesn’t really matter how good you are, if all you draw is vowels, you are not going to do well. Nevertheless, you still have some ability by employing one’s skill and knowledge to affect the outcome. An area of fantasy sports ethics that I am very interested in is the ethics of playing fantasy. By this, I mean how should fantasy players play? Are there ethical issues here? Let me suggest a few. One is the potential conflict of interest when the commissioner of a league is also a player in the league. This is usually the case, and it opens up the potential for the commissioner to set the game in his or her favor. I don’t know how often this occurs, but the potential conflict is something that one needs to be aware of. Another is the potential for more knowledgeable players to take advantage of newbies in terms of trades or staking out the waiver wires. This seems unfair and it can lead to a lack of competitive balance. A frequent problem in fantasy leagues is the ghost team. This is the team owner that, because of extended absence or lack of attentiveness, fails to set their line-ups properly, starts injured players, or starts guys in their bye week. This tends to upset the balance of leagues and undermines the playfulness of the game. Failing to keep one’s team up-to-date and the lineups set is a failure to meet one’s obligations as a fantasy player. One of my friends had drafted Adrian Peterson for his team last year. He was outraged, like most people, at the stories being reported about Peterson’s overly aggressive physical punishments–even abuse–of his children. He faced a dilemma: should he still start Peterson? Should he hold onto Peterson in case he came back that year? This was not special to my friend or Peterson. In discussing the Peterson case with my friend, I realized I had the Carolina defense which starred, at the time, Greg Hardy who was accused of domestic violence. I faced the same dilemma, should I start that defense? This is an interesting question for fandom in general. When the players we root for get into trouble—legally or morally—how should we respond? Do we withdraw our support immediately and completely? Which offenses go too far? In terms of being a fan, rooting for the player does seem to impart some approval or at least sanction to the player. So the issue of fan support is somewhat clearer: if a player has done something that you can’t support or be a part of as a fan, you should withdraw your support. But, in regards to fantasy, how much does drafting and starting a player constitute sanctioning or condoning the athlete’s behavior? Should one refuse to draft any players from the Washington Redskins? What about a Michael Vick or a Ray Rice? I don’t have a clear idea of what the right answers are to these questions. Too often, conversations about ethics are all negative. They focus too much on when people step over the line or violate norms. But ethics should also be about the positive, the aspirational, the ideals we shoot for as we attempt to live a flourishing and good life. So I want to close my comments by focusing on three positives of fantasy sport. In an age when friends and family can live far apart from each other, fantasy is one way to build, maintain, and deepen that community and connection with our friends and family. Another important value from fantasy is knowledge. Fantasy requires one to learn more about the real game. To do well at fantasy requires one have a good understanding of the game and the players. You can’t draft a left guard, but you better know if the QB you drafted has a good offensive line to protect him. Learning new skills and gaining knowledge is an important part of the good life and to the extent that fantasy does this, it too is part of the good life. Ayn Rand. (1999). The Journals of Ayn Rand. P. 604. Pingback: Are You (Morally) Ready for Some (Fantasy) Football? | What's Wrong?